On July 28, 2018,Zhangjiajie Wulingyuan’s Sky Garden Tourism Electric Vehicle operation ceremony was held. Wulingyuan District leaders Zhu Yongwen, Xiang Xujie and Qin Jinting attended this operation ceremony. Sky Garden Tourism Electric Vehicle is located in Dingxiangrong’s Old house,Tianzishan Mountaintop,Zhangjiajie core scenic spot.also Located in the middle of Tianzi Mountain and Yangjiajie, and 20 minutes drive from Yuanjiajie Scenic Spot,It is the first place to watch the sunrise and sunset scenery of Zhangjiajie mountaintop. According to the person in charge of Sky Garden Tourism Electric Vehicle Company, 10 electric vehicles will be put into operation for the first time. 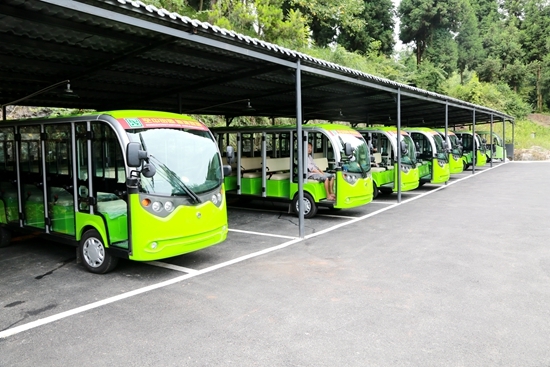 In the later stage, 20 electric vehicles will be put into operation to ensure the ability to receive 400,000 tourists this year.